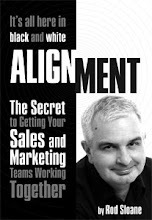 Sales and Marketing Alignment Blog from Rod Sloane: "Shut Up, Now!" Sometimes we are better off saying less! Do you know how hard that is for a professional speaker to say? You hear enough from me, don't you? You know what I do. Today, I'm simply going to shut up and give you a rest.